You are here: Home > Blog > Flora & Fauna > An autumnal bee – the Ivy Bee, Colletes hederae. At this time of year, it is unusual to see bees flying around, but one that you might see is the ivy bee; the ivy bee is a ‘new bee’. It was first described as a distinct species in 1993. It was present in the Channel Isles, back in the 1970's (where it is abundant) but was not recognised as a separate species. In the U.K., it was first reported from Dorset (at Worth Matravers) in 2001. It has since been found in a number of places along the South Coast – from Kent to Cornwall, and in Wiltshire, Somerset, Surrey and Essex. 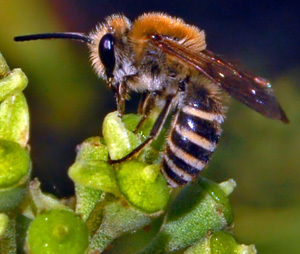 It is spreading northwards, and reached the north Norfolk coast (in 2014) and Shropshire; it has been suggested that the presence of the ivy bee here is another aspect of climate change. A map of the areas where this bee is likely to be seen can be found here. The Ivy Bee is a species of mining bee that likes to form a nest in loose sandy soil - often on south facing banks or cliffs, with sparse or limited vegetation (though nesting sites have been reported at allotment plots and the lawns of public parks). Though they are solitary bees (as opposed to bees with queens, drones, workers living in colonies), there may be hundreds or thousands at one nesting ‘site’. It is the last of the solitary bees to emerge each year - the females emerge in mid to late September [Ivy tends to flower in October]; bees may still be found flying in November - truly an autumnal bee. The thorax (middle section of the body) of the bee is covered with orange / brown hair, and the abdominal segments also have an 'orangey hair band'. As the name of the bee suggests it is dependent on the Ivy (Hedera helix) and its flowers - for pollen and a source of nectar. However, the bees will also gather pollen from other late flowering species if Ivy is not in flower - for example, perennial wall rocket.